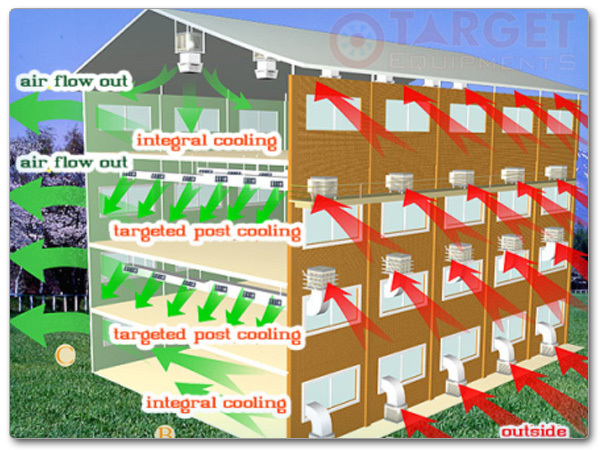 Target equipments evaporator cooling system division manufacturing includes of Evaporative cooling performance which installed outside of wall, brings fresh air into room by air distribution pipe with lowest power consumption, allows door and windows open, make your workshops and offices, factories cool in hot weather to be possible by paying 80% less power consumption to get best productivity and highest working efficiency. This dynamic due to changes in external temperature and humidity level. Under typical operating conditions, an evaporative cooler will nearly always deliver air cooler than 27°C (80°F). A typical residential 'swamp cooler' in good working order should cool air to within 3–4°C (5–7°F) of the wet-bulb temperature. Target cooling machines ensure even & continuous water distribution which in turn gives higher cooling efficiency .Water distributor used will not allow circulating water to leak/to fall fan motor or to deviate its flow. Even water distribution will ensure higher cooling.